Google Chrome is an open source, fast and easy to use web browser, that combines a minimal design with sophisticated technology to make the web safer. It's the most used web browser with over 50% market share across all platforms combined. Use one box for everything - type in the address bar and get suggestions for both search and Web pages. Use thumbnails of your top sites to access your favorite pages instantly with lightning speed from any new tab. Desktop shortcuts allow you to launch your favorite Web apps straight from your desktop. Google's browser was first released in 2008, for Microsoft Windows, and was later ported to Linux, macOS, iOS and Android. Chrome is also the main component of Chrome OS, where it serves as a platform for running web apps. Chrome's software architecture was engineered from scratch to cater for the changing needs of users and acknowledging that today most web sites aren’t web pages but web applications. Google Chrome offers a private browsing feature called Incognito mode prevents the browser from permanently storing any history information or cookies from the websites visited. Incognito mode is similar to the private browsing feature in other web browsers. Note: Chrome Browser is also available for enterprise businesses, Google Chrome Enterprise. Speed - designed to be fast in every possible way. Simplicity - minimal, clean and simple design. Security - built-in malware and phishing protection, auto-updates to make sure you have all the latest security fixes. Privacy - protect the information you share when you’re online. Customization - tons of ways to customize Chrome by adding apps, extensions, and themes. 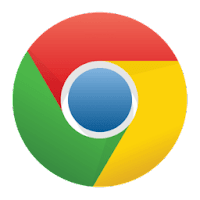 Disclaimer: Direct downloads for the lastest version of Google Chrome 61.0.3163.91 are provided by the official software's author, we can't guarantee safety, availability or download speed. Moreover, we don't and we won't provide any pirated/illegal versions or tools. We recommend you to avoid it as these methods can harm your device. If you like the software, buy it to support the developers. (We provide software discounts for many worldwide brands).